Click "Join" (no password required). If dialing in separately, dial 1-877-267-1577, meeting # 998 084 717. Click here to download a recurring calendar event with these access details. Slides from the March 26, 2019 Tech Talk. Slides from the March 12, 2019 Tech Talk. Slides from the February 26, 2019 Tech Talk. Discussion of the bugs being addressed in the Cypress 4.0.2 patch release, as well as several recent issues. Slides from the February 12, 2019 Tech Talk. Discussion of the bugs being addressed in the Cypress 4.0.2 patch release. Slides from the January 29 Tech Talk. Slides from the January 15 Tech Talk. Cypress Validation Utility + Calculation Check, and Episode of Care vs. Population based measures. Slides from the December 18 Tech Talk. CYPRESS-1525 and CYPRESS-1537 issues, the Cypress Validation Utility + Calculation Check, and timing differences in QDM and CQL. Slides from the December 4 Tech Talk. CYPRESS-1498 and CYPRESS-1503 issues, and the Cypress Validation Utility + Calculation Check. Slides from the November 20 Tech Talk. CYPRESS-1498 and CYPRESS-1503 issues, and the Submission Readiness Check. Slides from the November 6 Tech Talk. Details of the Cypress 4.0.1 Patch release and the 2018.1.0 bundle release, and CYPRESS-1503. Video recording of the October 23 Tech Talk. Announcement of the Cypress 4.0.1 Patch release and the 2017.0.4 bundle release, CYPRESS-1450, CYPRESS-1461, CYPRESS-1443, CYPRESS-1480, CYPRESS-1483, CYPRESS-1488 and CYPRESS-1490. Video recording of the October 9 Tech Talk. Video recording of the September 25 Tech Talk. Video recording of the September 11 Tech Talk. Video recording of the August 28 Tech Talk. Video recording of the August 14 Tech Talk. Announcement of the Cypress 4 release on July 26th and CQL time calculation. Video recording of the July 31 Tech Talk. 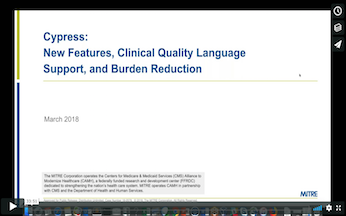 Announcement of the Cypress 4 release on July 26th and Discussion of the differences with Episode-of-Care and Patient based measure calculation with CQL. Video recording of the July 17 Tech Talk. Slides for the Cypress Traning. A walkthrough of all of the Cypress features. Slides for the Cypress Traning. Video recording of the July 10 Tech Talk. Video recording of the June 19 Tech Talk. Video recording of the June 5 Tech Talk. Video recording of the May 22 Tech Talk. Video recording of the May 8 Tech Talk. Video recording of the April 24 Tech Talk. Introduction of the upcoming Cypress 4 Alpha release. Video recording of the April 10 Tech Talk. Video recording of the March 27 Tech Talk. Reviewing CYPRESS-1356, Calculation bug in CVU with author time on order elements. 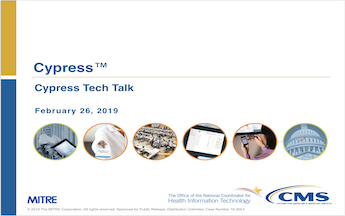 Video recording of the February 27 Tech Talk. Learn about eCQM sessions at HIMSS 2018. Video recording of the February 13 Tech Talk. Demonstration of the Cypress API. 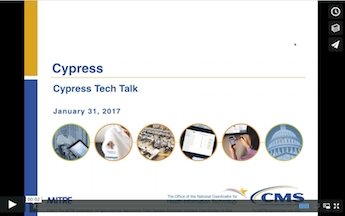 Video recording of the January 30 Tech Talk. Demonstration of the Cypress Features and Cypress API. 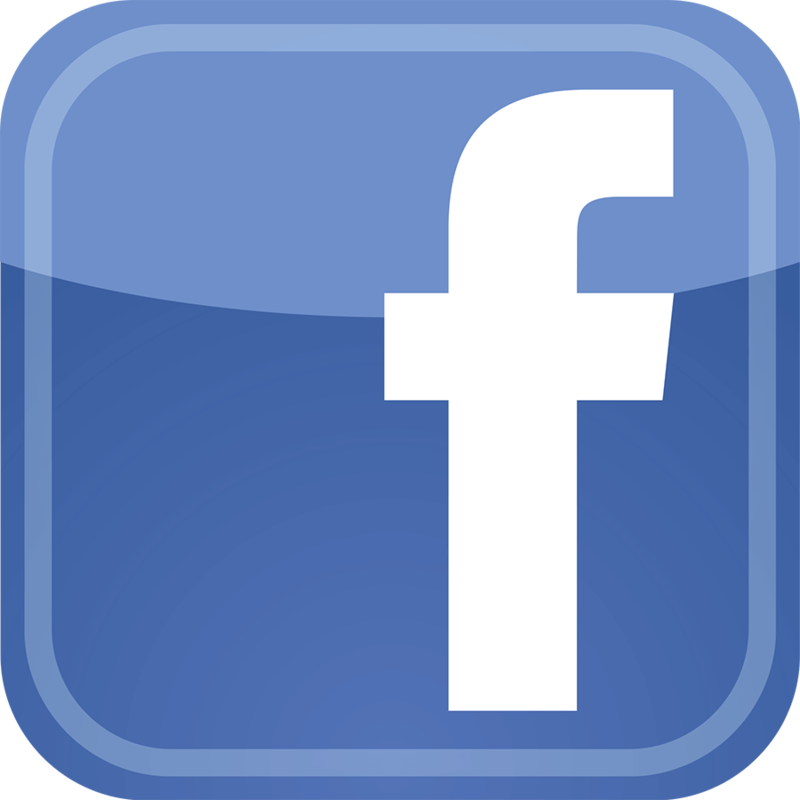 Video recording of the January 17 Information Session. Overview of the Cypress v3.2.3. Demonstration of the Cypress Validation Utility. Video recording of the January 16 Tech Talk. Overview of the Cypress v3.2.3 patch release with support of the 2014 ONC Certification Edition. Video recording of the December 19 Tech Talk. Video recording of the December 5 Tech Talk. Discussion of CQM-2804 (Reporting using the 2017 Q4 Addendum Value Sets). Overview of the Cypress v3.2.3 patch release with support of the 2014 ONC Certification Edition. Video recording of the November 21 Tech Talk. Overview of the Cypress Bundle releases, and allowances for manual entry during certification. Video recording of the November 7 Tech Talk. Overview of recent Cypress releases. Video recording of the October 24 Tech Talk. Overview of the Cypress v3.2.2 patch release. Video recording of the October 10 Tech Talk. Video recording of the September 26 Tech Talk. Overview of the Cypress v3.2.1 patch release, Cypress-1146 and the 2017 Bundle Patch. Video recording of the August 29 Tech Talk. Overview of the Cypress v3.2.1 patch release. Video recording of the August 15 Tech Talk. 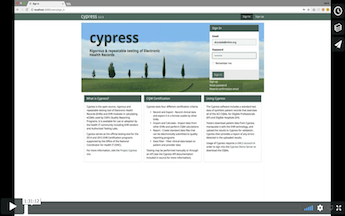 Overview of features included Cypress v3.2 release. Video recording of the August 1 Tech Talk. 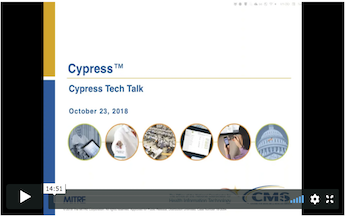 Discussion of the upcoming Cypress v3.2 release. Video recording of the July 18 Tech Talk. Discussion of downloading, installing and providing feedback on the Cypress Beta Release. 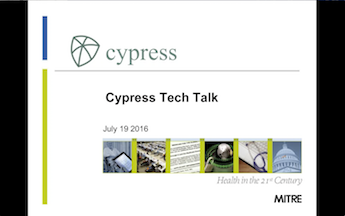 Discussion of features in the upcoming Cypress v3.2 release. Video recording of the July 11 Tech Talk. Discussion of downloading, installing and providing feedback on the Cypress Beta Release. Video recording of the June 20 Tech Talk. Live demonstration of features to be included in the Cypress 3.2 Release. Video recording of the June 6 Tech Talk. Video recording of the May 23 Tech Talk. Discussion of the scheduled Cypress 3.2 Release, the 2017 Annual Update measure publication, and the 2018 CMS HQR Implementation Guide. Video recording of the May 9 Tech Talk. 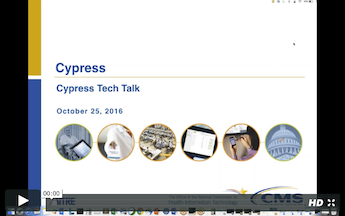 Discussion of anticipated features in Cypress 3.2. 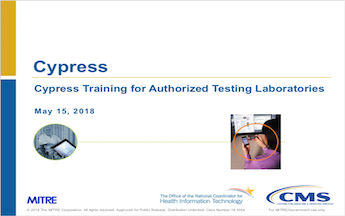 Extended conversation of testing the deduplication of test patients. Video recording of the April 25 Tech Talk. Video recording of the April 11 Tech Talk. Discussion of anticipated features in Cypress 3.2. Video recording of the March 28 Tech Talk. Discussion of negated valuesets, QRDA TemplateId Validation, the standards supported by Cypress and anticipated features in Cypress 3.2. Video recording of the March 14 Tech Talk. 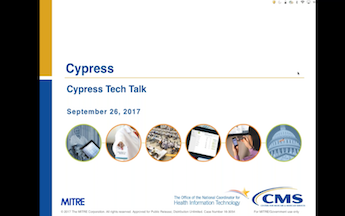 Discussion of negated valuesets, the standards supported by Cypress and a recap of the Cypress presentation at HIMSS. Video recording of the February 28 Tech Talk. Discussion of CQM-2386 and running the Cypress update script. Video recording of the February 14 Tech Talk. Discussion Cypress-915, CQM-2386, and running the Cypress update script. Video recording of the January 31 Tech Talk. Discussion of the Cypress 3.1.0 release including the CMS 2017 EC Implementation Guide and Schematron. Video recording of the January 17 Tech Talk. Discussion of the upcoming Cypress 3.1.0 release (on January 10th) to include the CMS 2017 EC Implementation Guide and Schematron. Video recording of the January 3 Tech Talk. 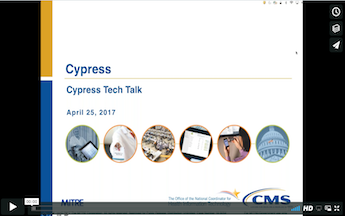 Discussion of the upcoming Cypress 3.0.4 release to include the CMS 2017 EC Implementation Guide and Schematron. Video recording of the December 20 Tech Talk. Video recording of the December 6 Tech Talk. Walkthrough of a Cypress "C1 Manual Test"
Video recording of the November 22 Tech Talk. Video recording of the November 8 Tech Talk. Video recording of the October 25 Tech Talk. Video recording of the October 11 Tech Talk. Video recording of the September 27 Tech Talk. 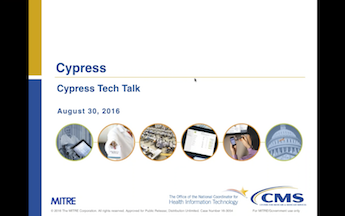 Video recording of the August 30 Tech Talk. Video recording of the August 23 Tech Talk. Video recording of the August 16 Tech Talk. Video recording of the July 19 Tech Talk. This project was funded by a contract from the Centers for Medicare & Medicaid Services (CMS) with coordination from the Office on the National Coordinator for Health Information Technology (ONC).